Recently announced Star Wars galaxy’s Scum and Villainy will soon join the fast-paced dogfights of X-Wing™ as the game’s third faction. Arriving in the game’s sixth wave of expansions, the Scum and Villainy faction brings to battle a mix of new starships and older starships repurposed for new use. Simultaneously, the faction’s fleet also introduces two new types of upgrades, the illicit upgrade and the Salvaged Astromech upgrade . Along with the mix of ships available to it, as well as the unique talents of its pilots, the faction’s two new types of upgrades go a long way toward defining the distinct play style you’ll soon be associating with the galaxy’s most notorious Scum. 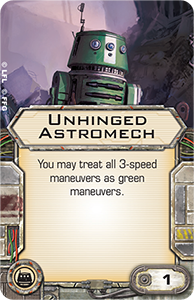 In today’s preview, we’ll look at some of these new upgrades and the ways in which they help to reinforce the faction’s identity as the shadiest, most opportunistic, and most self-serving of all X-Wing factions. It’s no big surprise that the Scum faction is the first to make use of the illicit upgrade. After all, as these upgrades represent the array of technologies that the Empire has chosen to outlaw, they belong to the galaxy’s black markets, and who runs those? The galaxy’s Scum and Villainy. 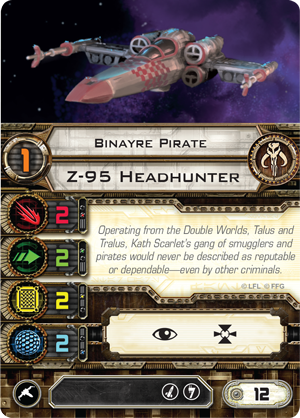 Of the seven different starships introduced to the Scum faction – or reengineered to suit its fleets – all but the Y-wing and M3-A “Scyk” interceptor gain access to the illicit upgrade, though the StarViper-class attack platform only gains access to the upgrade type through the use of the unique Virago Title card. Combined with the fact that it is currently unique to the Scum, its ubiquity makes the illicit upgrade one of the faction’s most defining elements… along with the many dirty tricks it permits. Like the “Hot Shot” Blaster, each illicit upgrade breaks the game’s standard rules with some form of novel, high-impact game effect. 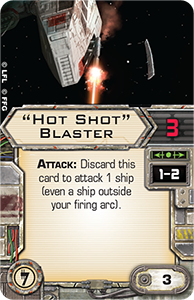 The ability to fire at ships outside of your firing arc is always a powerful game effect, but equipping a “Hot Shot” Blaster can also lead to some interesting mind games. Most likely played on a ship, like the Z-95 Headhunter, that costs far fewer squad points than any ship with a turret weapon, the “Hot Shot” Blaster is designed for just one use, but it still forces your opponent to accommodate its threat from the beginning of the game until the moment you fire it. Moreover, the “Hot Shot” Blaster isn’t even the only illicit upgrade that allows you to damage a ship flying outside of your arc. Both the Feedback Array and Dead Man’s Switch allow you to land automatic damage against starships within Range “1,” although, admittedly, both do so at rather steep costs. A Feedback Array allows you to damage any one target within Range “1.” However, to use the Feedback Array, you must forego your attack and receive one ion token. Even though you’d be trading away your attacks for just one damage, that’s a trade in which the value is easy enough to identify. You might find yourself outflanked, lacking a shot altogether; or you might want to land just one more damage on a ship that you’re touching, in order to finally destroy it. The ion token, however, is another matter. Ionized ships are forced to utilize straight speed “1” maneuvers, which leaves them exposed and predictable. Still, there are definitely times even the ion token is an acceptable cost. 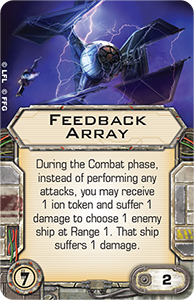 For starters, if you equip IG-2000 with a Feedback Array, the first ion token won’t ionize your ship. Then, since the Feedback Array costs just two squad points, one might imagine equipping it on up to seven Binayre Pirates who could then simply fly within Range “1” of the target of their choice and obliterate it, no dice required. 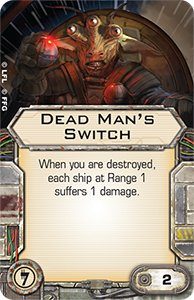 Likewise, the Dead Man’s Switch offers your Scum another way to deal damage without the use of attack dice, though its cost is even steeper than that of the Feedback Array. Only activated when your ship is destroyed, a Dead Man’s Switch deals one point of damage to each ship within Range “1.” This is interesting in a couple of ways. First, it accurately portrays the Scum faction as a collection of vengeful and self-centered individuals, only happy to cooperate so long as the credits continue to flow. Second, it encourages Scum players to fly out of formation, even with its cheapest ships, such as the HWK-290 and the Z-95 Headhunter. 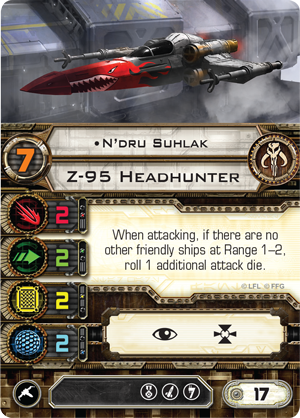 And while Dead Man’s Switch might introduce the first ability that would prompt us to rethink these formation-based tactics, our reevaluation is further reinforced by other cards within Wave VI, including the ship card for the Z-95 Headhunter pilot, N’dru Suhlak. Finally, there’s more to the illicit upgrade than just the potential to deal damage. They can also allow you to stop your ship in mid-flight. 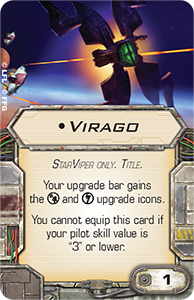 That’s what Inertial Dampeners do, and for just one squad point, this upgrade is bound to give the Scum faction’s most highly skilled pilots a tremendous one-shot advantage in the Activation phase. After all, not only do Inertial Dampeners effectively add a maneuver to your ship’s dial, but they allow you to avoid taking any maneuver that would place your ship in a position that’s worse than the one in which you find it. Would your planned flight path have put you square in the sights of an enemy ship? Hit the Inertial Dampeners and avoid that maneuver. As the game continues to reward pilots with high pilot skill values, Inertial Dampeners provide Scum pilots their own, distinctive means of outmaneuvering their foes. Although the Scum faction’s Y-wing can’t benefit from the illicit upgrade, it is by no means forgotten. 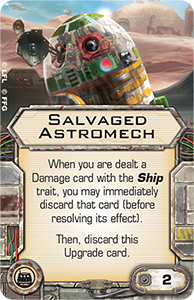 The Most WantedExpansion Pack introduces no fewer than eight different upgrades for Scum Y-wings (many of which the Rebellion can also equip), and of those eight, five share the new Salvaged Astromech upgrade type. Since this upgrade exists currently only among the Scum’s Y-wings, and replaces the standard Astromech upgrade featured by the Rebellion, it helps, once more, to define the faction. So what does it tell us? Among other things, it tells us that the Scum faction can be a bit less orderly and a bit more aggressive than their rivals, and it once again reinforces the idea that Scum pilots follow their own interests and their own flight paths. That isn’t to say, however, that Scum pilots are any less capable than their opponents. They just have their own style, and self-preservation ranks right near the top. Accordingly, for just two squad points, the Salvaged Astromech serves as great insurance against some of the game’s most crippling critical hits, including the devastating Direct Hit. 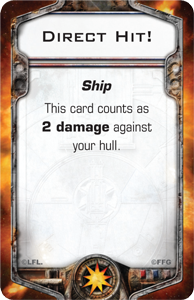 Of course, Direct Hit isn’t the only damage card with the Ship trait. In fact, there are no fewer than ten different damage cards with the Ship trait, and they can cause malfunctions in your secondary weapons, reduce the effectiveness of your primary weapons, limit your ship’s agility, or prevent you from performing actions listed in your ship’s action bar. Any one of those hits could severely hinder your fighter’s effectiveness in combat, and two squad points is a small price to pay for insurance. Yet, though two squad points may be a rather small price to pay to grant your fighter limited immunity from an early crippling blow, you might still elect not to play with Salvaged Astromech simply because you feel other Salvaged Astromech upgrades may better suit your strategy. 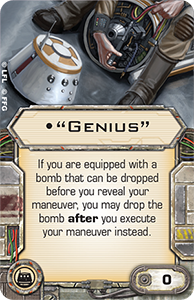 For example, the Most Wanted Expansion Pack allows you to outfit your Y-wings with a Bomb Loadout, and you might want to complement your Bomb Loadout with the Salvaged Astromech upgrade, “Genius.” If your Y-wing pilot has a lower pilot skill value, “Genius” adds another layer of mind games to your activation phases, forcing your opponent to guess whether or not this is the round that you’re going to deploy your Proximity Mines or drop your Proton Bomb, then guess whether you’ll do so at the beginning of your maneuver or at the end of it. “Genius” can be even more aggravating and aggressive if your Y-wing pilot has a high pilot skill value. 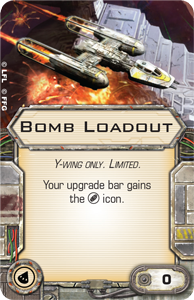 Now, your opponent has all the same questions to ask himself, but if your Y-wing moves after your opponent’s ships, you can see exactly what’s going to happen when you drop your bombs. Sure, if you drop them at the end of your maneuver, your Y-wing is going to take the hit, too, but it has five hull and can likely survive the hit. Less directly aggressive, but still dedicated toward bold tactics and fast maneuvers is the Unhinged Astromech. For just one squad point, this Salvaged Astromech upgrade allows you to treat all your speed “3” maneuvers as green maneuvers, and since the Y-wing’s speed “3” maneuvers include two turns, two banks, and a straight, the Unhinged Astromech essentially reinvents your Y-wing’s maneuver dial, transforming the fighter from a relatively slow and clumsy fighter into a machine that can easily zip around the battlefield, outmaneuvering your foes with ease, just so long as you can do so while consistently flying near top speed. Again, since it’s difficult to imagine that a squadron flying in formation at such high speeds could consistently catch enemy fighters within their firing arcs, the Unhinged Astromech is yet another upgrade that suggests the Scum faction plays best when it flies out of formation and relies upon its individual pilots to make the best possible use of their ships. If so many of the Scum faction’s pilot abilities and upgrades discourage flying in formation, how will its squadrons ever compete with the best squadrons that the Imperials and Rebels can bring to battle? The answer is that Scum and Villainy players will have to learn how to make the most of all their dirty black market tricks and toys. The new illicit upgrades and Salvaged Astromech upgrades are likely to feature heavily in Scum squadrons, and we’ll get a better idea of how they’ll help the faction compete with the Imperials and Rebels as we continue our previews of Wave VI and explore more of what the StarViper Expansion Pack, M3-A Interceptor Expansion Pack, IG-2000 Expansion Pack, and Most Wanted Expansion Pack have to offer!